Print magazine covers are having a bit of a renaissance. Perhaps it’s the fact that the Instagram-loving public cares and understands more than ever what goes into a good image, or that global political turmoil has given editors and designers more material, but it definitely feels like there’s growing emphasis on striking and adventurous imagery on magazine covers. AdWeek recently, and rather cynically, suggested that in the US, a decline in magazine newsstand sales has led to a corresponding emphasis on more exciting and adventurous covers aimed at subscribers. Whatever the reason, there’s been copious discussion lately about magazines on social media. It’s also been the subject of two events that I’ve been lucky enough to attend. 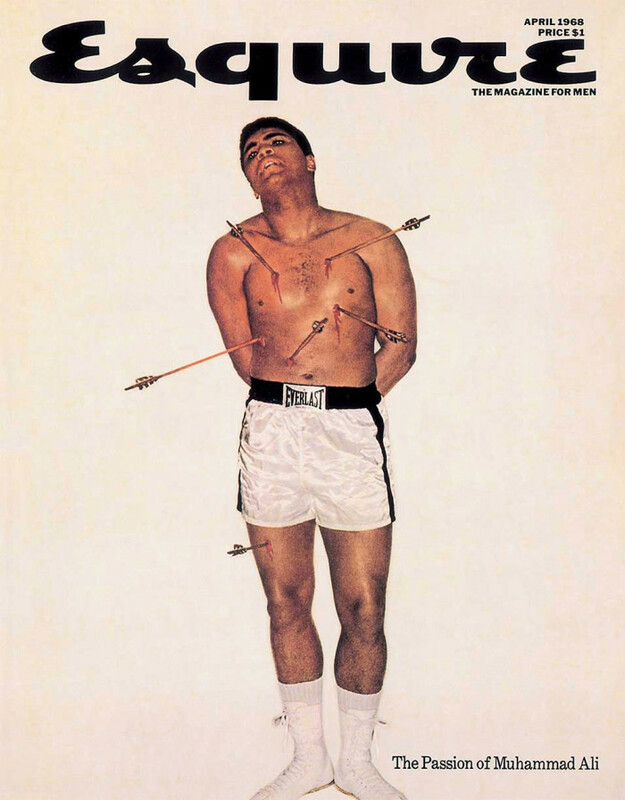 The other week I went to a very interesting talk on the topic of great magazine covers, chaired by Ian Birch, the former editorial director of Hearst who has recently released a book about this subject, Uncovered – Revolutionary Magazine Covers. 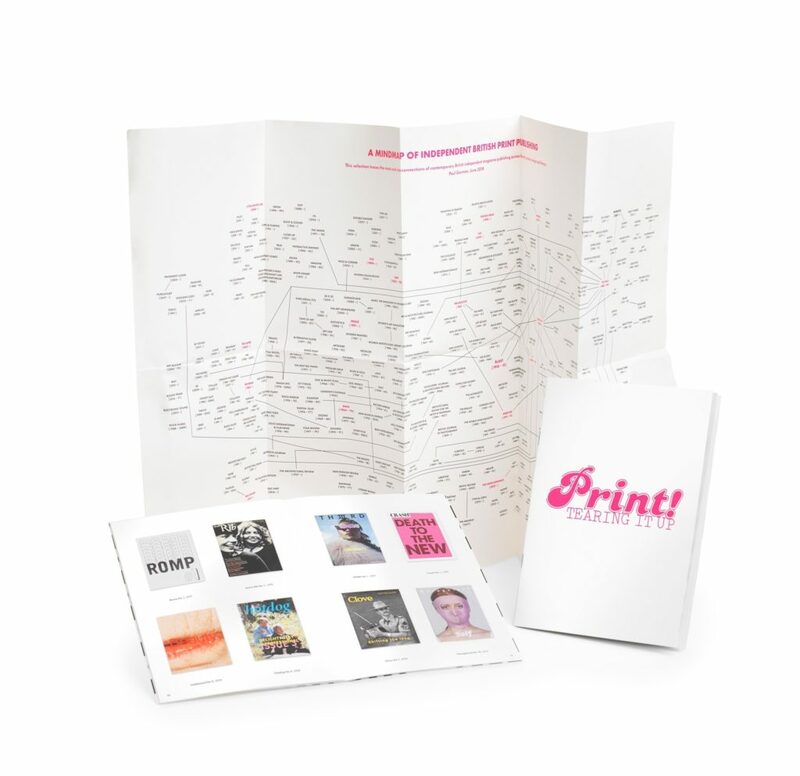 It also included Penny Martin, the editor of the Gentlewoman, Paul McNamee, editor of The Big Issue, and Robin Derrick, former creative director of British Vogue who is now pursuing a beauty project. That excellent exhibition, which mostly focused on how independent magazines influenced mainstream publishers, introduced itself by saying that reading a magazine, smelling the ink and flicking through its glossy pages is “one of the great pleasures in life.” What Ian Birch’s discussion at the British Library argued is that without a good cover for that magazine you would never have picked it up in the first place. Here are some selected thoughts and notes from that talk, which I hope you might find useful. As Robin Derrick said in the discussion at the end, “It was Nick [Coleridge, chairman of Condé Nast Britain] who said [magazines] are bought on station forecourts with a sandwich and a packet of crisps.” They need to grab the reader’s attention and satisfy a need, in this case a need for a bit of entertainment for a train journey. When I have the time to buy and read a magazine, it’s often when I’m travelling. If I have an international flight I love to pick up a New Yorker or another glossy, and often it’s the cover or cover lines that will make me decide whether to pick up a copy. Robin later hammered this home by saying, “People at Vogue think they work in fashion. They don’t, they work in publishing.” Hmm. I also liked Paul McNamee’s practical thoughts about covers. 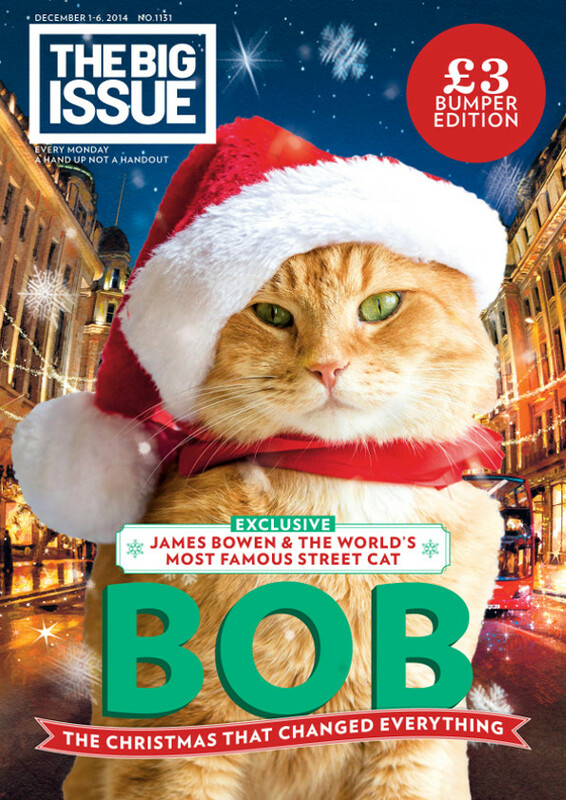 When he found himself deciding to put Bob the Big Issue cat in a Santa hat on the cover of the magazine for the Christmas issue, he said, “I’m a commercial editor. When we put that cat on the cover, it goes like crazy. There are no rules. If the cat works for you, put it on the cover. Not every week though. That might get a little tired.” He did admit, though, that he had another cat cover in his bag, planned for publishing within a few weeks. Ian Birch dwelled for a minute on International Times (It), “the newspaper of resistance” and Britain’s first underground paper. Talking about his March 1969 cover featuring an interracial couple kissing — which was still a taboo at the time — then-editor Peter Stansill said, “This might have been a provocative cover, but not to us. I never asked anybody outside of our readership what they thought about it. It was of no interest to me whether it would be accepted or not in the wider world. There were no cover lines, no accompanying story, it was just let’s send a visual message.” That’s certainly a common theme in what makes a great cover: an absence of cover lines, and letting a strong image do the talking. Also, read this excellent story by the photographer Horace Ové, who was the first black director to make a full length feature film in Britain, Pressure, in 1975. Robin Derrick’s favourite cover of all time is also one of the most simple. 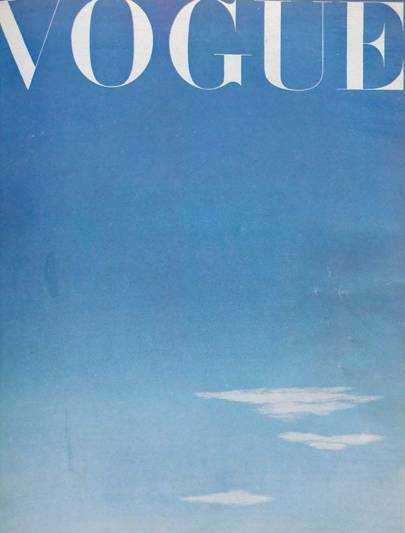 British Vogue’s October 1945 cover was no more than a painting of a blue sky with a few clouds and haze, signifying the end of the second world war. After half a decade of twisting contrails left behind by bombers and fighters striking through the sky, the sky evokes a feeling of freedom which must have felt completely correct to people at the time. Derrick said it’s one of the few magazine covers he can think of that is of a blue sky. 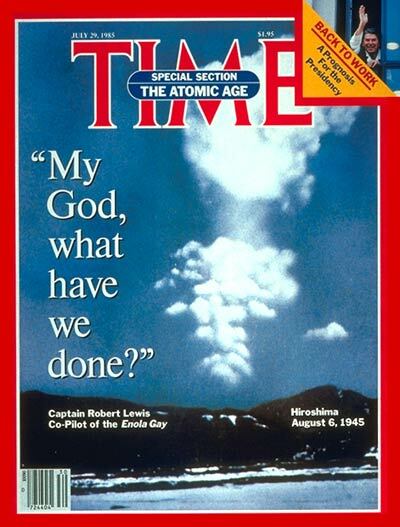 I can only think of one other, which happens to cover the same event: Time magazine’s July 1985 cover showing the cloud after the Trinity test, marking the 40th anniversary of Hiroshima and the birth of the Atomic age. Are commercial ideas killing great magazine coverlines? Finally, some thoughts from me about how I’ve seen the process of magazine covers change. Today, it’s quite common to see editors and art directors taking a collaborative approach to selecting a cover, or at least being a bit more open about the process. For instance, I really enjoy seeing Sunday Times Magazine Art Director Dan Biddulph posts “options” after he’s finished every cover, so I can see what they’re up to and give an opinion about which one I like the most; British GQ, where I used to work, recently experimented with teasing covers before they were released and making them available to buy on their digital app before it’s out on newsstands; and British Vogue has made the cover reveal an event in itself, sometimes including tickets, and often accompanied by equally compelling videos. When it comes to fully animated covers, no-one has topped Teen Vogue‘s gun control issue with Tyler Mitchell, and their video series about the process behind finding new figures for the cover is great too. And in fashion, you only know you’ve made a compelling image if PortisWasp has remixed it. What is your favourite cover and why? Leave a comment below. If magazine covers are so important for popular culture and mainstream debate, why is there no magazine equivalent of #TomorrowsPapersToday, where every cover gets collated, shared in high definition and can be shared and debated? Tweet me if you think that should happen.